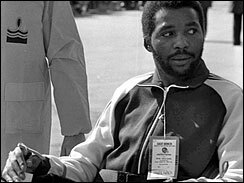 Jack Tatum, the Pro Bowl safety for the Oakland Raiders best known for his crushing hit that paralyzed Darryl Stingley in an NFL preseason game in 1978, has died. He was 61. Nicknamed "The Assassin," Tatum died of a heart attack Tuesday in an Oakland hospital, according to friend and former Ohio State teammate John Hicks. In 2009, NFL.com ranked Tatum as the sixth most feared tackler of all-time. Despite Tatum's failure to show remorse, Hicks said Tatum was haunted by the play. "It was tough on him, too," Hicks said. "He wasn't the same person after that. For years he was almost a recluse." Tatum had said he tried to visit Stingley at an Oakland hospital shortly after the collision but was turned away by Stingley's family members. Part of the alienation came after Tatum wrote the 1980 book, "They Call Me Assassin," in which he was unapologetic for his headhunting ways. Tatum played under coach Woody Hayes at Ohio State, where he was recruited as a running back. He later switched to defense, where he played linebacker and defensive back. "We have lost one of our greatest Buckeyes," said Ohio State football coach Jim Tressel. "When you think of Ohio State defense, the first name that comes to mind is Jack Tatum. His loss touches every era of Ohio State players and fans." After starring at Ohio State, Tatum was drafted in the first round by the Raiders in 1971. 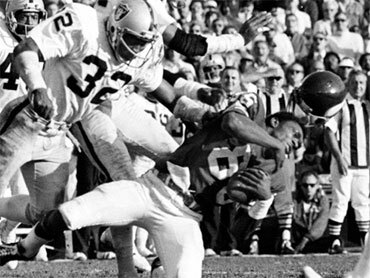 In nine seasons with the Raiders, Tatum started 106 of 120 games with 30 interceptions and helped Oakland win the 1976 Super Bowl. He played his final season with the Houston Oilers in 1980. Tatum was not penalized for his hit on Stingley (pictured at left in a 1979 file photo) and the NFL took no disciplinary action, but it did tighten its rules on violent hits. Tatum also wrote books titled "They Still Call Me Assassin: Here We Go Again" in 1989 and "Final Confessions of an NFL Assassin" in 1996. In the latter he wrote, "I was paid to hit, the harder the better. And I hit, and I knocked people down and knocked people out. ... I understand why Darryl is considered the victim. But I'll never understand why some people look at me as the villain." Tatum was also a central figure in "The Immaculate Reception" in the Raiders' 1972 playoff loss to the Pittsburgh Steelers. With 22 seconds left, Tatum jarred loose a pass to Frenchy Fuqua from Terry Bradshaw, and the ball bounced off Fuqua's foot and ricocheted into the arms of Steelers running back Franco Harris. Harris never broke stride and ran 42 yards for the winning touchdown.